​When determining how much laminate you will need for your job you must first determine what you are laminating. ​When measuring for refacing it is assumed that the face of the boxes will be laminated in full sheets with excess cut out and discarded. This eliminates lines that are created over joints. However, when laminating with wood grain colors you may want to cut the material into strips so that the styles and rails are laminated in a way that makes the product look more like real wood (vertical grain on stiles, & horizontal on rails). If you subscribe to the idea that time is money then you will understand that the cost of material spent to full face vs the significantly longer time it takes to piece together small pieces is a zero sum game. To figure out how much laminate to order you will need to find out the linear footage (LF) of the exposed surfaces on both the upper & lower cabinets and add them together. Be sure to count the sides of the cabinets and the backs of peninsulas when figuring out the footage. Once you have figured out the Linear footage you will convert the number into linear yards (LY) by dividing the total LF by 3. Next you will round up to the next whole number. This will give you the amount of material you should order. See example below. Assume your cabinets, including sides, came up to 25 Linear feet (measuring horizontally). At this time, RefaceSupplies.com doesn’t sell moldings. However, watch for updates on our website for molding options and pricing coming soon. When available, moldings will be sold in 8’ sticks. 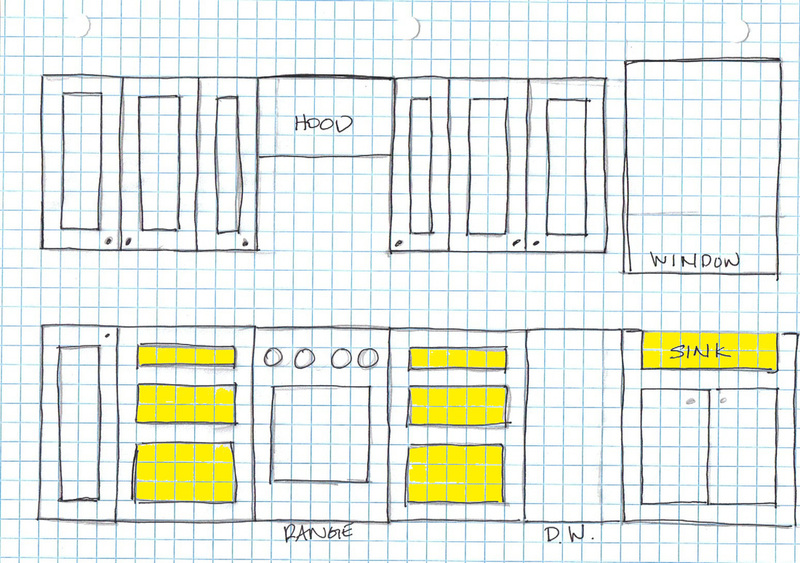 For estimating purposes you just need to count the number of doors and drawers. If you have a corner cabinet where the door is pieced together with a hinge on a 90 degree angle, be sure to count it as two separate doors. Below is an example of a small kitchen. Count the doors and drawers. The answer key is highlighted. At this time, RefaceSupplies.com doesn’t sell hardware. However, watch for updates on our website for hardware options and pricing coming soon. Most often hardware is chosen by touch and feel as it is a very tactile product. For this reason it is suggested that a customer find their own hardware to have installed as there are endless selections to choose from. The hardware is the jewelry on any cabinet remodel. Just like jewelry is an expression of your style, so is your hardware. Express yourself. It is important to be VERY accurate when measuring your doors & drawer fronts. The best method is to count like sizes together. For example, you might want to count all of your upper doors first as they are mostly going to be the same heights. Then you may want to count the lower doors because they too will be mostly the same in height to each other. ​.Drawer fronts tend to be of similar width because they often stack on top of one another. Drawers are also grouped together because, unlike doors, the width measurement is usually bigger than the height. There is another reason why drawers should be measured together as well. If you are laminating using a directional pattern, (like woodgrain), you may want to control the direction of the pattern. For this reason you want to be sure to measure to notate pattern direction on the doors & drawer fronts separately. Measurements for doors & drawers can be as accurate as a 1/32 of an inch. However, it is more common that you will measure to the nearest 1/16 of an inch. 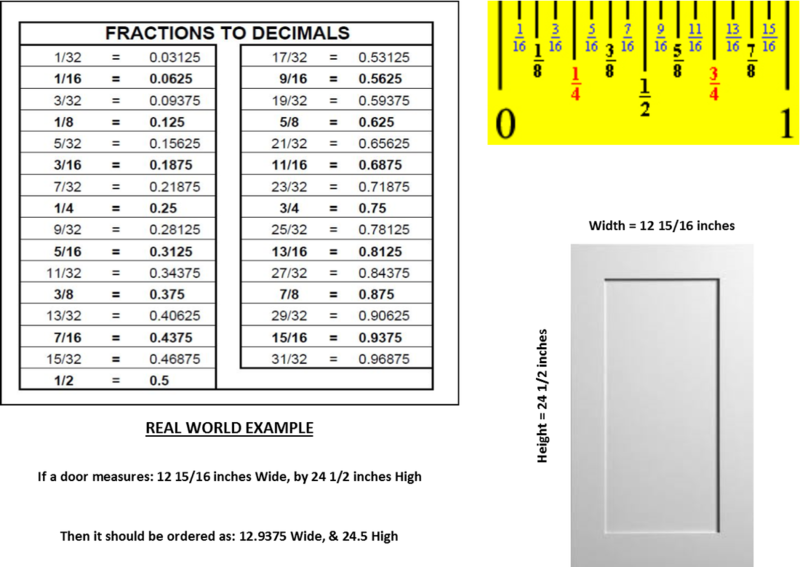 Due to the fact that all orders must be placed using a decimal system, a conversion chart has been provided below for use when converting from fractions to decimals. Additionally, for those who may not be used to using a tape measure, a sample tape measure has been provided as well. On the door order form you will find a section regarding hinges. This will not be required if you are using exposed hinges. However, if you are using concealed hinges then you will need to order your doors pre-drilled. Remember that your hinge should clear any roll outs or shelves within the cabinet. It is important to note that though all or most of your doors will have the same measurement for hinges, you should check them all to be sure and note any differences on the order form. To measure for hinges, remove a hinge from an existing door. Measure from the TOP EDGE of the door to the CENTER of the existing hinge hole. Repeat the process for the bottom hinge.